Conventions have their own rules for ticket holders and BlizzCon is no exception. You must wear the issued name tag at all times when you're in the convention hall. Players take that mandate farther and commission artists to draw their game toon. I wasn't exactly sure how that worked, but I knew I needed some sort of temporary ID until I could get the official one. The official one comes with a lanyard. Casting about my home, the only lanyard of any note was one I got about 10 years ago when I visited Colonial Williamsburg. While that was okay, it came with a heavy duty clear ID pocket, it was absolutely NOT geeky enough for me. Speaking of geeky, there is a service called "Loot Crate". Every month, you get a box filled with miscellaneous stuff tailored to your gaming interest, or your dog. (They don't do anything for cats.) I think it was in either August or September's Loot Crate, there were World of Warcraft items. One of my coworkers, Tara, gets a crate and, knowing my game play, gave me a few items she didn't want. She also got these in her crate and she didn't want them. 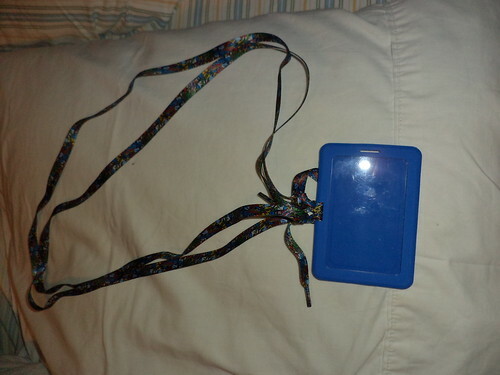 At first, I thought it was a lanyard. One of my guild members who also gets a crate said, "Um...Gimm? (Gimmlette is my game toon's name. Everyone calls me "Gimm".) Those are shoelaces." Okay. I can make this work. 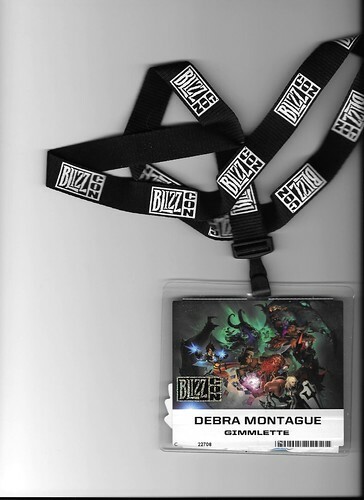 I've accumulated some lanyards which are very lightweight and tried to create a stronger necklace to wear until I got the BlizzCon one. I found an old luggage tag and, with some experimentation, this was the end result. The shoelaces were long so I wound up folding them in half to make it work. The Marvel design was clearly visible and, after printing out a screenshot of my toon, the whole thing worked moderately well. This was credit card size and, if I had so desired, I could have kept an ID or a credit card in the pouch where it was easily accessible. But my purse (see below) did such a fine job, I never resorted to sticking anything other than the photo in the container. Once Ashley arrived, the three of us set out to get our tickets and goodie bags. 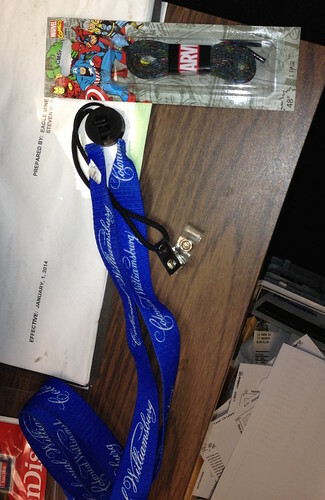 Part of what you get is a premade lanyard and ticket combo. This is nice. If I wanted to, I could reuse this for some other event. It's got my name and my toon's name on it. When you're in a convention like this, your real name is almost secondary to your toon's name. The few times I introduced myself, I was "Hi, I'm Gimmlette, from Spectacular Death on Llane." It's your toon name, guild name and server name. That's who you are. That realization was rather humorous. The ticket pocket is big enough to stick something behind the official ticket, if you wanted. My shoelace improvisation can't hold a candle to this. I don't know where, exactly, to display it. I'm extremely glad I got to attend this event. This lanyard and ticket are treasured keepsakes. I just need to find a place worth of them with which to display this. Onward with the cleaning and purging.